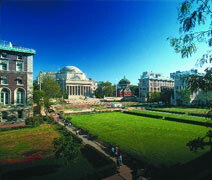 Columbia University was founded in 1754 as King’s College by royal charter of King George II of England. On a grassy neoclassical campus in the heart of New York, New York, Columbia creates a perfect balancebetween city lifeand a campus community. TYPE OF SCHOOL: Founded in 1754 as King’s College, Columbia is a residential, private, coeducational, highly selective Ivy League university with a strong focus on undergraduates. SIZE OF CAMPUS: Columbia is situated on 36 acres in the residential neighborhood of Morningside Heights, located in the northwest section of Manhattan in New York City. NUMBER OF STUDENTS: Undergraduate enrollment is approximately 4,500 students in Columbia College and 1,500 students in The Fu Foundation School of Engineering and Applied Science. NUMBER OF FACULTY: Columbia students enjoy close collegial interaction with faculty members who are widely recognized as leading scholars in their disciplines. The student-faculty ratio is 6:1. COLLEGES, PROGRAMS, AND DEGREES: Columbia University has many different opportunities for undergraduate degrees. Within Columbia College, students pursue a Bachelor of Arts. Students interested in a Bachelor of Science study at The Fu Foundation School of Engineering and Applied Science. In addition to Columbia’s undergraduate programs, the University encompasses more than a dozen graduate and professional schools. GEOGRAPHIC DIVERSITY: Columbia University students come from all 50 states and over 90 countries, and more than 50% self-identify as students of color. Moreover, Columbia University enrolls one of the largest percentages of foreign students of any major private research university in America. INTERNATIONAL STUDENT SERVICES: In addition to the International Students and Scholars Office, which provides resources for international students and assists with their transition to the United States, there are dozens of international student groups and a special pre-orientation program for new international students. INTERNATIONAL STUDENT BUDGET: Other than travel, expenses are similar to those of domestic students. 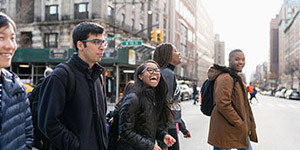 FINANCIAL AID: Columbia awards more than $168 million in financial aid each year and meets the full need of all applicants admitted as first-year students who have applied for financial aid, regardless of citizenship. Admission is need-blind for US citizens and permanent residents, persons granted refugee visas by the United States, and undocumented students. • The SAT or the ACT is required. • 50% of students admitted in 2017 scored between 2140–2390 on the SAT or 32–35 on the ACT. • Students for whom English is not a first language should consult our website for our policy on English proficiency testing. APPLICATION DEADLINES AND FEES: The application postmark deadline for Early Decision candidates is November 1; for Regular Decision candidates, it is January 1. The non-refundable application fee is $85. It is the oldest institution of higher learning in the state of New York and the fifth oldest in the United States. Columbia lies northwest of Central Park on Manhattan’s Upper West Side in Morningside Heights, which runs from 106th to 125th Streets and is bordered by three beautiful parks. Within this academic acropolis, students have a home base in which to live, study, and play. Housing, all within a five- to 10-minute walk of academic buildings, is guaranteed for four years, and nearly all students live on campus. A distinctive component of the Columbia experience is the Core Curriculum, the nation’s oldest and most renowned Core program. Rather than general education requirements, the Core is a single set of small discussion-based seminars taken by all undergraduates. Students from Albania to Zimbabwe challenge each other’s thinking about groundbreaking ideas. It’s a common intellectual experience that inspires greater depth of conversation and thinking in all classes because students have a richer and broader base of knowledge on which to draw. 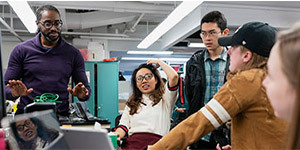 Through both Columbia College and The Fu Foundation School of Engineering and Applied Science, students can take classes and be involved in research that advances what the world knows in every area. Our imperatives are to connect undergraduates with world-renowned faculty and to help students find their strengths and true passions. There is a 6:1 student-faculty ratio, and over 80% of undergraduate classes have 20 or fewer students. Hundreds of labs and research institutes led by prize-winning faculty working with students launch over a dozen start-ups each year and have generated over 1,000 active patents. With a diverse international student body and a cosmopolitan faculty, Columbia gives students a home in the most global city in the world. With the United Nations nearby, Columbia is also the home of the annual World Leaders Forum, where distinguished global leaders engage in lively, uninhibited dialogue with students and faculty. We have formed partnerships with communities, governments, and institutions around the world and have established a network of Columbia Global Centers located in cities such as Amman, Beijing, Istanbul, Mumbai, Nairobi, Paris, Rio de Janeiro, and Santiago. The International Students and Scholars Office provides resources for international students and assists with their transition to the United States. Newly admitted students are also invited to attend the International Student Orientation Program in August prior to move-in. Additionally, among the more than 500 different student clubs and organizations, there are dozens of international student groups.